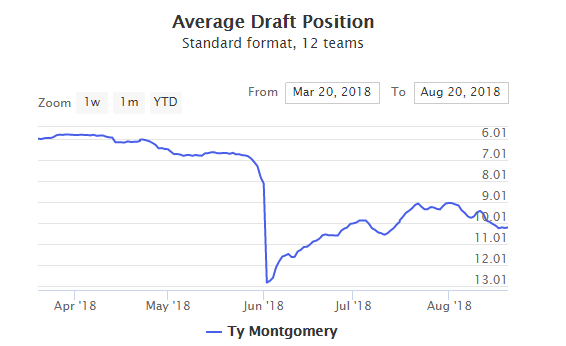 On June 18th, Head Coach Mike McCarthy said the Packers will have a “running back by committee.” As you can see from the graphic, Ty Montgomery Fantasy’s stock took a plunge that day. TYMont went from a 7th round running back with upside in the spring, to a 13th round hopeful in the Summer. Fortunately, TYMont has been making a respectable climb in average draft position. The NFL suspended Aaron Jones two games for violating the league’s substance abuse policy in July, and Jamaal Williams injury concerns put Ty Montgomery’s fantasy relevance back into perspective. Ty Mont’s Fantasy value may depend more heavily on the scoring format you’re league is using. Ty Montgomery holds far more value in PPR leagues than standard scoring despite his ADP being roughly the same. While Davante Adams and Jimmy Graham may demand the most attention from secondaries, watch for Aaron Rodgers to use his pass-catching RB in the redzone a sneaky fashion to his advantage this season. 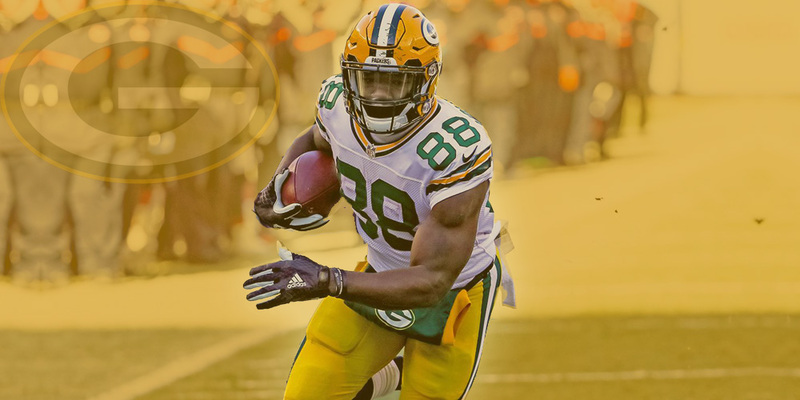 One of the bigger debates of the 2018 offseason was whether or not the Green Bay Packers will keep Ty Montgomery at running back or if they will move him back to wide receiver. The combination of last season’s injuries, rookies Aaron Jones and Jamaal Williams having impressive debut campaigns, and Green Bay’s decision to move on from receiver Jordy Nelson, it seemed probable that Montgomery could make the switch. In February, this notion gained steam as many around the industry suggested that it was the right time for the move. At face value, a move back to WR for Montgomery does make sense. 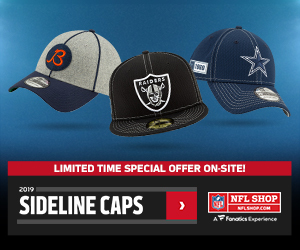 The move would mean less wear and tear as the fourth year pro does come with durability concerns. After all, he has missed 19 games in his career and 18 of those games came in 2015 and 2017 when he was a bigger part of the offense and was on the field more. The Packers went on to select Missouri’s J’Mon Moore in the fourth round (133rd overall), USF’s Marquez Valdes-Scantling (fifth, 174), and Notre Dame’s Equanimeous St. Brown (sixth, 207) in the 2018 NFL Draft. This marked the fifth time that Green Bay selected three wide receivers since 1992 and the moves put to bed once and for all the idea that Montgomery may change positions. This year’s Packers offense could be one of the most dynamic in the NFL. The Packers receiving core is young, promising, and most importantly BIG. The Packers only have one wide receiver that stands under six feet tall and he just happens to be one of the better slot receivers in the NFL in Randall Cobb. Beyond the wide receivers, the Packers may have the most impressive tight end corps in the NFL as well. On top of signing Jimmy Graham early in the offseason, they added all-pro tight end Marcedes Lewis on May 25. The signing gives the Packers nine potential pass catchers over 6’3″ that could contribute this season. When you begin to factor in a stacked backfield that will feature three young backs, including Montgomery alongside sophomore’s Williams and Jones, the Packers will undoubtedly have no trouble scoring points. With all this firepower, What exactly will Montgomery’s role be? Here’s what we know: When he’s given the opportunity he produces. With 233 touches in three seasons, he’s racked up 1401 yards from scrimmage and has found the end zone nine times. Montgomery is a yardage monster when he gets the rock. In his career, he averages over six yards per touch. An average that is higher than David Johnson, Kareem Hunt, Le’Veon Bell, Ezekiel Elliot, Todd Gurley and Leonard Fournette’s over the same span. So it begs the question, if Montgomery stayed healthy in 2017 would we be talking about a top ten fantasy RB heading into 2018? Possibly, but the reality is Green Bay will most likely head into next season deploying a three-headed monster at the position. In Montgomery’s absence, 2017 rookies Aaron Jones and Jamaal Williams both proved that they belong in the NFL. Jones ran for 125 yards and scored against Dallas in week 5 and then ran for 131 and a score against New Orleans. Williams ran for 113 yards and scored against Tampa Bay and caught seven balls for 69 yards and scored against Cleveland. Not knowing who will be the primary back heading into 2018 is a good problem to have if you are the Packers but it makes things tough for potential fantasy owners this season. It’s important to consider that Green Bay has revamped their coaching staff including bringing back offensive coordinator Joe Philbin. The former Dolphins head coach did not call plays in his last stint as offensive coordinator with the Packers but he did have a major influence on what plays were called and when. In fact, former Packers GM Ted Thompson said Philbin and Mike McCarthy called plays together. With the duo of Philbin and McCarthy, Green Bay’s offense was among the best in the NFL. The Packers reached the playoffs in four of those five seasons, reached the NFC Championship game twice and won the Super Bowl in 2010. To compare what the Packers offense could look like in 2018, we should look at Philbin’s final year as OC in 2011, the Packers set a franchise record in points scored, total yards, touchdowns and passing touchdowns. They finished the season 15-1 record and Aaron Rodgers won his first MVP award. The Packers ran the ball 39.43% of the time which was 7th least in the NFL, but they did run for over 100 yards a game on nearly 25 carries for 4.1 yards per carry. Ryan Grant and James Starks both split carries rushing for 559 and 578 respectively. We can expect that Green Bay will be splitting carries this season among three backs instead of two. The Packers will likely start David Bakhtiari at LT, Lane Taylor at LG, Corey Linsley at C, Justin McCray at RG, and Bryan Bulaga at RT if healthy for the majority of the 2018 campaign. Bakhtiari was ranked the best offensive tackle in the NFL according to Pro Football Focus last season. Linsley was the 17th best run blocker and Bulaga is a pro bowl level talent if healthy. Packers running backs shouldn’t have immediate issues with running lanes in 2018.